The later production 1965 Mustang which was manufactured after August 17, 1964 has been differentiated by Ford Mustang enthusiasts and classic car restorers, due to several major changes. One of the most obvious changes in this latter part of the 1965 model year lineup, was the addition of an all new for 1965 Ford Mustang fastback, which not only improved the pony car's aerodynamics, but created an almost cult following for the sleek new Ford which continues to today. 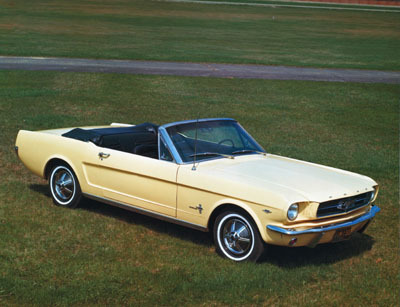 began from the moment the first 1965 Mustang rolled off the assembly line. 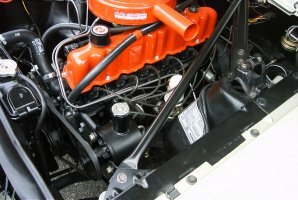 Engine choices changed for the later 1965 cars. The 170 cubic inch straight 6 cylinder was replaced with a 200 cubic inch six, that produced 120 horsepower. The 260 cubic inch V8 engine was replaced with a 289 2V engine, which produced 200 horsepower. The 289 cubic inch High Performance engine, received upgrades, bumping up the horsepower from 210 to 225 HP. And a special High Performance 289 cubic inch 4V engine with a higher compression engine and other improvements provided 271 horsepower. Over the years, this engine has received some reverence, both for it's dramatic boost to the performance and image of the little pony car and now, for it's rarity. Ford Mustang enthusiasts and aficionados commonly refer to this engine as the hi-po, or hipo. It's also referred to as a K-Code car. Having a K-Code Mustang means that the serial number contains the letter K for the engine designation, which is only possible if your car came from the factory with this engine. Extra grunt was provided by the option of either a 3.89:1 or 4.11:1 ratio rear axle combination. Changes under the hood included fitting 2 smaller horns to the front side of the fan mounting. At the same time, the 1964 1/2 battery cooling fins were removed. An alternator replaced the venerable generator set up, which also allowed the battery to run cooler. Hinges were no longer black. The new Mustang hood stamping, now had tooling that folded over the sheet metal at the leading edges of the hood,providing a cleaner, more finished appearance. It also added necessary stiffness and allowed the removal of the under hood support. The headlight bucket bezels were reshaped and the early bevels at the top were removed since there were now no clearance issues. 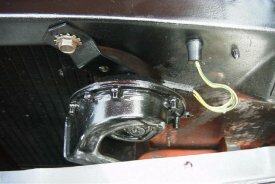 The gas cap for all later 1965 cars had a wire ring attached to the back of the housing, that attached it to the filler mouth plate with a screw in ring fitting. The lower body Mustang logo letters were widened to 5 inches. Here's a link to both the Mustang data plate codes for 1965 Mustang paint colors and the names of the colors. Three body styles were offered. The coupe and convertible introduced earlier in the year, plus a new more aerodynamic looking fastback Mustang body. The Ford Mustang fastback body style offered a fold down rear seat for extra cargo carrying and just made it downright racy! 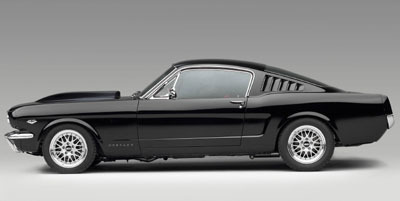 Here's a link to more 1965 Ford Mustang fastback information and 65 Mustang fastback pictures. Ah... the 1965 Ford Mustang convertible. The convertible was only slightly more expensive than the coupe (wish that was true today...) and still kept it's weight around the 2,500 lb mark, that had been set for the little pony car. For many of us, this very car, represents everything we ever wanted in a car. It was light, fast, great looking and attracted stares and admiring glances like no other car, close to it's price. Carpeting was improved and extended up the sides of the rocker areas and fit under the inner rocker panel stainless steel trim. The overall dash was mostly unchanged, however the instrument cluster indicators had been changed to remove the GEN light and replace it with an ALT light, thanks to the addition of the alternator. The optional interior mentioned below had a wood grained fascia, replacing the plain black Falcon look. The standard door panels remained the same, however a new Pony interior option was created featuring upgraded door panels featuring integral arm rests, plus the addition of special raised and embossed Pony logo seat covers. Courtesy lights were included in this upgraded interior. 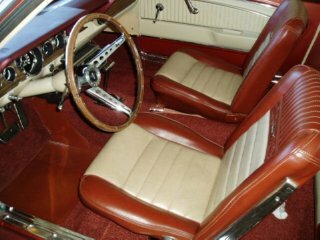 Both versions, the 1964 1/2 and the 1965 had an optional center console, which was an available option for both automatic and manual transmission choices. These consoles have become highly desired by people restoring classic mustangs, and are fetching high prices if they are in good condition. The treatment also continued outside of the car. A new high performance package was introduced in the latter part of the model year and was known as the GT package. The 1965 Mustang GT package included the 271 Horsepower 4 barrel High performance 289 V8, with either a 3 speed automatic or 4 speed close ratio transmission. It included a full dual exhaust system with classy chrome trumpets which exited through holes surrounded by chrome rings in the rear valence. To round out performance, a special handling package and disc brakes became available. Exterior Mustang GT cues included a specially made grille which contained 2 fog lamps,a GT logo insignia, available Gt stripes, and a five gauge cluster replacing the idiot lights of the standard model. Continue on to the full Mustang GT story. Here's even more specific 1965 Ford Mustang GT information and specs. Like the optional console, there were many other options available for the cars. Some, like the built in spotlight, were downright strange, others were pretty cool, like the Rally-Pac which was a combination tachometer and clock combination, which mounted onto the top of the steering column. 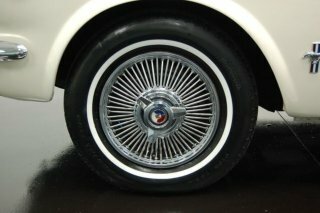 Also available was a "knock off hub", which was actually a hub cap with a knock off style spinner. Although it seems surprising these days, one option was a left hand remote control mirror. The standard mirror was manually set. Ford also supplied as an option a pretty tacky looking metal handle by the drivers seat used to remotely open the trunk lid. Talk about king of the road! Ford engineers, took one of those hot little dual overhead cam 5.0 liter motors, stuffed 4 dual Webers and a Tremec 5 speed into this fully restored Mustang fastback and got a very impressive looking and performing 400 horsepower road rocket! Even ten years ago, it was difficult to find reproduction parts for a 1965 Mustang and enthusiasts were forced to use old parts that were in poor condition or replace rotted out metal by hand. Nowadays, you can find almost anything in reproduction parts to bring your classic back to life. For more information on what's available click on the link for 1965 pony car parts . 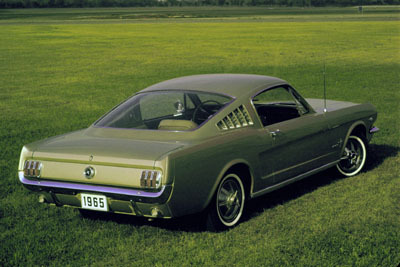 The 1964 1/2 and 1965 Ford Mustang was available with 16 different paint colors. Here's a link to the 65 Mustang Paint Colors Chart. Can you actually get auto loans for classic cars? Like insurance, classic car loans take a bit more work, but are possible. The great thing about financing a classic Ford Mustang, is that there are readily available values for different conditions of these cars. Typical older cars of the same vintage, don't always fare as well. There is a big market for your pony car, but not so much for a 60's Mercury wagon. Lenders look at the security, as well as your ability to repay the loan, so the odds are better for the average soon to be Mustang owner. Use this handy data plate decoder for the 1965 Ford Mustang to uncover information like paint code,axle ratio,interior and more. Here's the link to the Mustang data plate decoder. Return from 65 Mustang to Classic Mustang. Return to Ford Mustang from 1965 Mustang.